Snuggie, Slanket or Freedom blanket? Did any of them know about the Kashmiri pheran? To me it seems they are reinventing the wheel. While I have seen infomercials only from Snuggie, I saw this interesting post about it, followed by an equally interesting discussion in its comments, and that is how I found out about the other brands – the Slanket and the Freedom Blanket, and the apparent tussle for originality of the idea. Well, the Kashmiri pheran ( ) is also actually a blanket with sleeves. It can be made out of fleece, wool, or any fabric that keeps you warm. Every Kashmiri person living in Kashmir has to have a pheran. 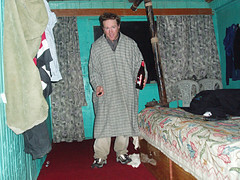 The difference between the blanket with sleeves being marketed in the West, and the pheran is this – while the snuggie appears to be open on the back, the pheran is not. It is closed, and you put it on like you would put on a sweater. Except, it is really long (below knees) and very loose (like a large blanket). In fact it has to be loose enough to create your own heated space around you, which you heat up using a kangri (or kanger, as it is called in Kashmiri). More on the kanger in a little bit — actually that merits a post of its own. First a little bit about Kashmir’s weather. When you think of India, you think of searing hot weather. But there are pockets of cold weather in India along the foothills of Himalayas – Himachal, Uttarakhand, the North East, and Kashmir. The weather in the beautiful valley of Kashmir can be compared to that of New York. Look at the screenshot of today’s weather in Srinagar (the capital city of Kashmir) and New York. The difference is, hardly anyone in Kashmir can afford to have a centrally heated home. That is where the pheran and the kanger come in. The pheran is your personal space that you sit with or move around with, and the kanger is your personal heater with which you heat that space. The kanger ( ) is basically an earthenware pot, around which a wickerwork jacket is woven to insulate it and to provide you with a handle. 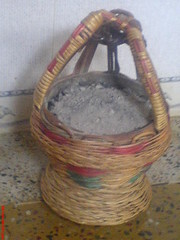 You fill the earthenware pot with wood charcoal, and put some burning embers on top. The heat works through the layers of charcoal, giving you nearly a daylong supply of heat. A good kanger-ful does not need a refill all day long, but most do. It all depends on the quality of charcoal you use, and the way you keep the heat outflow controlled (with a layer of ash forming on top). You keep the kanger within the pheran and heat up the space within. You sit with the pheran and the kangri, traditionally on the floor, which, needless to say, has to be well covered or carpeted. You go out and walk with the pheran, holding your own kanger within. Obviously, the essential, practical, traditional pheran has also given birth to the fashionable pheran, and that is what has become popular as a feminine apparel in other parts of North India, which has colder winters than the South, but not as cold as those in Kashmir. The fashion pheran is generally embroidered, is not as loose as the essential pheran, and mostly you can’t put your hands in. So, well, it is not much of a pheran. With the real pheran, people can go to work, shop, drive, and mostly do everything in a day’s work. During the winter, the pheran does not come off unless you go to sleep, or are going for a job that demands more formal wear. A pheran also generally comes with a potsh ( ), i.e., a pheran lookalike that is made of plain white cotton cloth and is used as the inner layer for the pheran. The potsh has multiple functions — it increases the amount of insulation given by the pheran, prevents the body’s dirt and odor to get to the pheran (you don’t wash the pheran that often), and gets washed and replaced more often than the pheran does — kind of a pheran liner. Do you see any similarity between the ‘blanket with sleeves’ and the pheran? One thing is for sure – I vouch for the idea of a blanket with sleeves, and since I cannot buy a pheran in the US, I am going to settle for the blanket with sleeves. And who knows with energy prices going the way they are, one day we may have to rely on the kanger too. Any inventors out there looking for ideas? if you were a true kashmiri you’d know that kashmir rightfully belongs to the beautful people of our land. And is not part of north india, pakistan, or china. Geographically it is actually central Asia, but Unless you’re hindu you’d be brainwashed to think it’s Indian soil never will we bow down to Indian goverment policy nor Pakistan. Thanks for your comment. Being anti-India does not make one a true Kashmiri. I am a true, full-blooded Kashmiri. I speak Kashmiri, I love the soil of Kashmir. All my generations have belonged to Kashmir. Kashmir is like my mother (moj kasheer) and I have spent all my growing years in Kashmir, until the sword of Islamic terrorism kicked me and my family out. Kashmir is very much a part of India. Most important shrines of Hinduism are in Kashmir. *You* have been brainwashed to think that it is not. You don’t have to bow down to India. You can give up your nonsensical fight against India and live in peace, but all you want is Talibani government and culture, which you will definitely get if you separate from India. Good luck with that. Keep fighting. My Kashmir has already been taken away from me, so it doesn’t matter to me either way. Now don’t ask me why I left. I left because even though I loved my motherland, I did not want to be part of what has been going on there since then. I loved my Kashmir, but I also loved my country — India, which is more important than anything else. I do not want Nizam-e-Mustafa, thank you very much. I will always be an Indian, but you cannot take Kashmir out of a Kashmiri, even if you throw him out of Kashmir. No, get your geography lessons right. Kashmir is not Central Asia. If Pakistan is South Asia, how can Kashmir be Central Asia? If Punjab and Jammu are South Asia, how is Kashmir Central Asia? Kashmir is very much a part of the Hindu heritage of India, which has been forcibly eroded over the centuries. Look at the centuries old temples of Martand. Look at the temple of Shankaracharya. If you are being taught new history and geography lessons, who is being brainwashed here? Garments like the Pheran are not unique to Kashmir, and not really much like the blanket with sleeves. It’s just a long woollen robe, the kind of thing worn for thousands of years in cold climates around the world. This ankle–calf-length style has fallen out of fashion in the west, except for certain religious communities, but shorter wool shirts (thigh–hip-length) are still produced in different styles by companies such as Woolrich, Pendleton, Filson, and Swanndri. I have two myself, both made by companies which also make blankets. There’s even a word in English for wearing them without an undershirt—to go woolward. These sleeved blankets are something different altogether. For one thing they are not intended as garments. Most are too long to move about in for even short distances, and are impractical for anything but purely sedentary activity (reading, watching tv etc.). A pheran allows you to move about, but leaves the feet and legs uncovered. A sleeved blanket covers the whole body while sitting or lying, but unlike a blanket allows you to use your arms without exposing them to the cold. Thank you for the post. I have received a pheran from a friend just back from Kashmir. How do you clean them? My smells of smoke and now I know why after reading your article 🙂 I love it. It is so warm and the wool is lovely. I would love to know the cleaning process that is done.